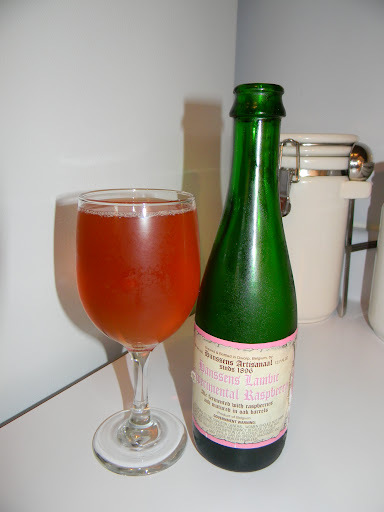 Review of Hanssens Artisanaal Lambic Experimental Raspberry | Beer Apprentice - Craft Beer News, Reviews, Interviews and Info. ← Review of Traquair "The Laird’s Legacy"
For today’s craft beer review I’m going to be trying the Hanssens Artisanaal Lambic Experimental Raspberry produced by Hanssens Artisanaal bvba located in Dworp, Belgium. I tried the Oude Gueuze a while back and really like it, so I’m hoping this beer entices my taste buds in much the same way. The brewery does not have a website that I know of, so I checked on ratebeer.com for some kind of description. The beer poured mostly clear, orange to slightly pink in color with absolutely no head whatsoever. No lace or anything. It looked like champagne. Very disappointing I thought. The nose was much better. Nice, tart, fruity raspberry with a solid bit of sourness. Hints of funk and “barnyard” along with a decent vinegar relish. Very nice underlying tones of oak and wood. Well balanced, sturdy and good. The taste let the sourness step forth a touch more. The raspberry seemed a bit more subtle, but it was still sweet and fruity. The funkiness was of medium intensity as was the vinegar redolence. The oak and woodiness hid underneath for added complexity. A nice acidic tickle at the back end. Nicely harmonized and flavorful. The mouthfeel was medium bodied. Very little carbonation was to be had. It was dry and smooth, but with a light bite at the back end. It was quite refreshing and crisp along with the fact that a suitable amount of flavor was left on the palate after the sip. Overall, this beer wasn’t bad. It wasn’t as good as the Oude Gueuze, but it still smelled and tasted just fine. The appearance and the mouthfeel were a bit subpar, but the drinkability was very high and made up for any lack of aesthetic appeal. I definitely think the Experimental Raspberry is worth a try if you can find it. Especially if you favor the Lambic/Sour style. Be sure to let me know what you thought of it if you happen to sample it also.